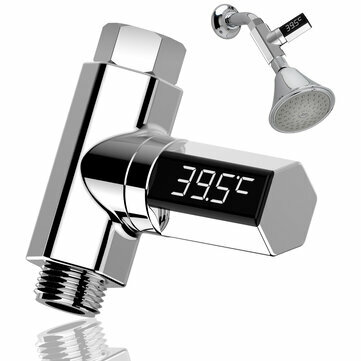 Loskii LW-101 LED Display Home Water Shower Thermometer one of the sensor accessories is made of rubber and is not stable water pressure. This Loskii LW-102 of one of the sensor accessories is made of stainless steel, now it is regulated, to prevent the water pressure from being too large, prevent the pcba board form burning off. The water pressure is low, and the water pressure is small, it can work better. self powered battery free thermometer to monitor your shower temperature. [As home essential Needed] - to serve and surprise your husband, wife or kids. 360°rotatable waterproof led screen for better viewing. [Elegant and sleek design]- premium quality even fit to all five star hotels level. to give people a real time monitor of the shower temperature. It is only show water temperature, not change or adjust water temperature. It is self powered, mainly comprises a hydro power generator, a thermal sensor, and a digital LED display.